Marrakech is a city that offers an indigenous, a madly inventive, and vivid hand- craft culture oscillating between ad-hoc kitsch and the archaic sublime. 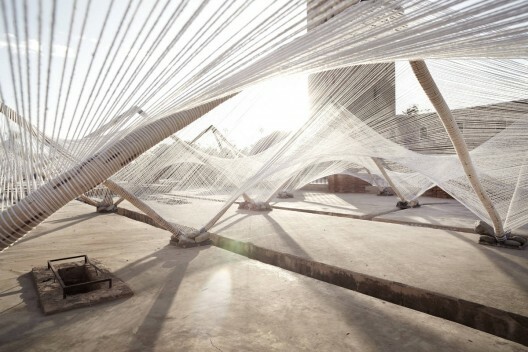 It is apparent that these techniques are readily available and could be appropriated for a proposal for this Biennale. The question for us became: what techniques, which form of knowledge, can be brought to this situation that could start to mediate tho- se that we find on-site and as-found? 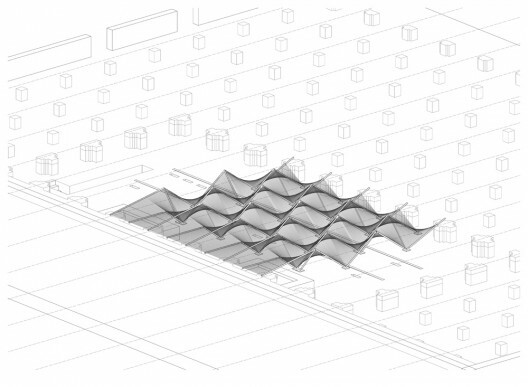 What effects can we produce by considering geometrical form as found in the architecture of Marrakech and as constructed by using current algorithm software programming (Grasshopper, Rhino for example) and then begin to speculate how these forms might be rendered (made physical) by local craft techniques and materials? In this way the work reflects aspects, which will be familiar as local and other aspects, which can be understood as universal. This is not a totally lineal process and there is a lot of back and forth, trial and error, and testing of different models but with a similar goal. 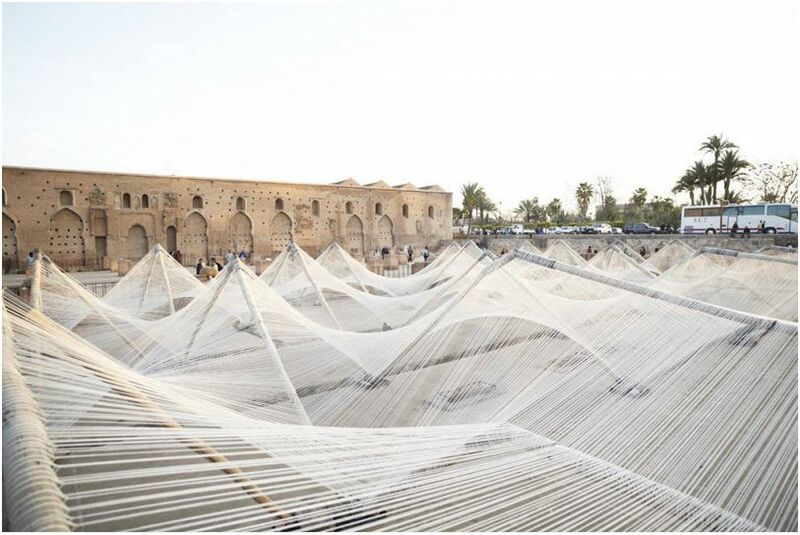 One of the local techniques that became compelling is traditional Moroccan weaving on a wood frame loom a craft which involves organizing wool or cotton yarn into an array of (typically colored) lineal lines of yarn warped through a loom weaving and tying in order to produce a woven fabric surface. The frame of the loom is a rigid structural frame which holds yarn in place as a series of parallel lines forming surfaces a technique we reapplied at an architectural scale with the ambition of producing not 2-dimentional surfaces but rather 3-dimensional volumes stretched over a series of fixed wooden frames. 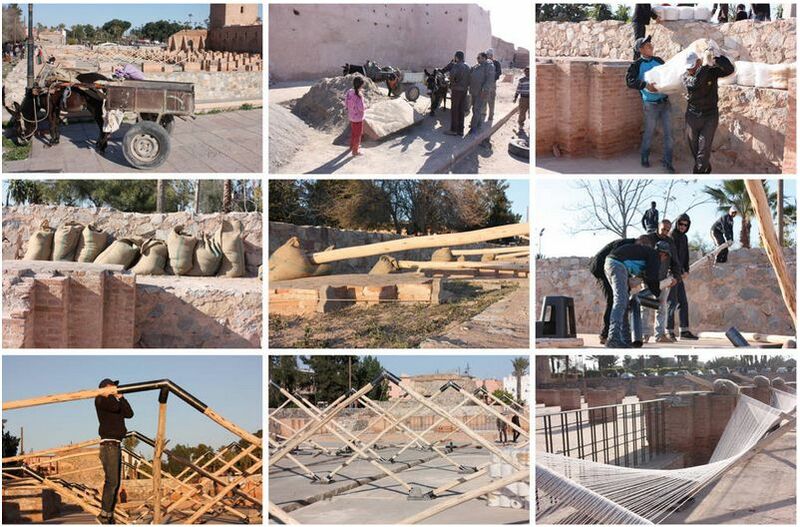 The ultimate site for our work, the ruin at the Mosque Koutoubia, informs and locates the proposed project and establishes a scale for the work. In this way the work becomes site-specific to this places and it’s restraints and opportunities. The broken-off columns establish a grid of 5×5 meters that the installation is adjusted to by halving it to a 2.5 x 2.5 meter grid, which in the logic of a hyperbolic surface established a 2.5 height in relationship to viewers who can walk around it or through it. The repetitive column grid of the ruin also establishes the repe- titive cellular grid of the loom-hyperbolic which is inserted into an open, slightly depressed, platform surrounded by the grid of the ruin on three sides. Beyond the serial/ cellular spatial matrix formed by it, of course, is it affected by the strong local daylight and will cast shadows of itself on the ancient surfaces around it. The roughly 1 to 2 cm spacing of the yarn defines hyperbolic volumes 18 times. The spacing is such that it generates enough surface to define these forms while allowing the forms to appear transparent, ephemeral, and layered when viewing them from different angles in contrast to the opaque and beautiful masonry sur- faces around it. 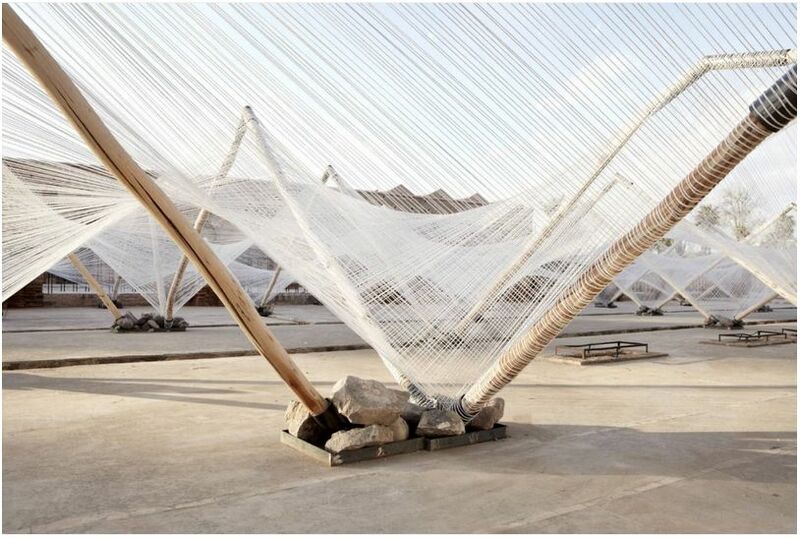 We chose a simple local construction of light hand-peeled pine poles attached to steel plates and tubes (which establish and fix the geometry) then pull yarn over the frames which alternate in their positions and tie them off as if they were laid over a giant loom spaced closely together. The irregular slightly bent forms of the wood poles softens the hard geometry of our digital computer drawings sympa- thetically. 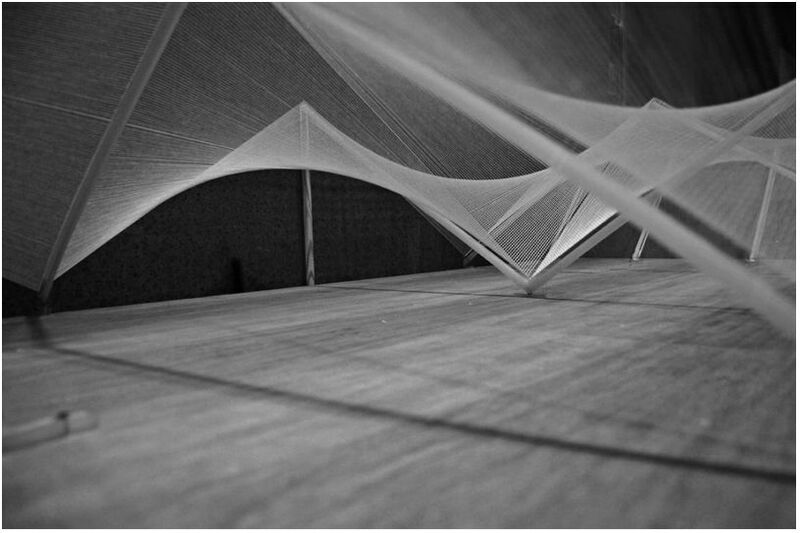 The lines of the yarn generate a lineal “ruled-geometry” which forms the hyperbolic surfaces. 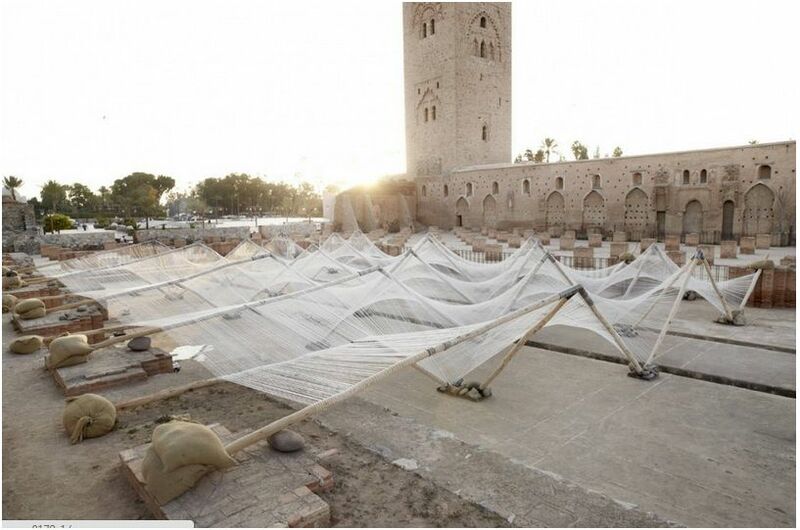 The installation can be viewed from above the ruin or can be moved around or through directly as it is at the scale of a series of tents. The very public nature of the site insures that the project can be seen by day or night and will be both familiar and foreign in this beautiful place.